An increase in mortgage rates is something no new buyer or existing homeowner wants to see. But why do we always see a fluctuation in rates? To help give you a better understanding, our team at the Canadian Mortgage Authority has explained how a rise in mortgage rates can affect you. It is no secret that your Hamilton and Grimsby mortgage rates are on the rise, but the question that is buzzing through homebuyers heads is why? Mortgage rates can be increased for a couple of reasons. The first is that the banks funding costs have risen, which means it is now more expensive for them to lend money. As a result, banks are trying to get borrowers to lock in a rate now, which can protect the homebuyers if the rates rise in the near future. The second reason rates are rising could be due to banks wanting to pad profit margins. This means that banks are trying to hedge against people who can’t make their payments. So, they are creating a risk management technique to offset the costs that are being lost from borrowers defaulting on their payments. Fixed term mortgages are tied to the bond market, in a rising bond market, fixed-term interest rates will rise. If you are a current homeowner and are looking to refinance, an increase in rates could affect your affordability. Your current bank may be less inclined to offer competitive rates, which means you might have to shop around the market to work your Grimsby mortgage broker who will provide you with the lowest rates. As a new or current homeowner, working with your current lender you will be automatically subjected to the new mandatory stress test. This is dependent on the current bank’s benchmark qualifying 5-year rate of 5.34% if insured, or their actual rate plus 2%. As the rates increase, your affordability is affected, which means you may not be able to borrow as much as you originally intended. As your preferred Hamilton and Grimsby mortgage broker, we have ways to stretch your affordability through our contacts with various lenders. If you are a current homeowner and are affected by the new Canadian stress test and wish to just pay off your fixed-rate mortgage early, you will be charged higher fees. One potential solution is to hold off on purchasing a home until you have more savings to help increase your down payment to decrease the size of your mortgage, thus reducing your interest costs.. However, if you are looking to purchase a home now, obtaining a variable rate mortgage could be the best option for you. Variable rate mortgages generally have an initial lower rate than a fixed-rate mortgage, which can help alleviate some financial stress. It is worth noting, however, that a variable rate is dependent on the Prime Rate so if the market increases, you will be required to pay more monthly. 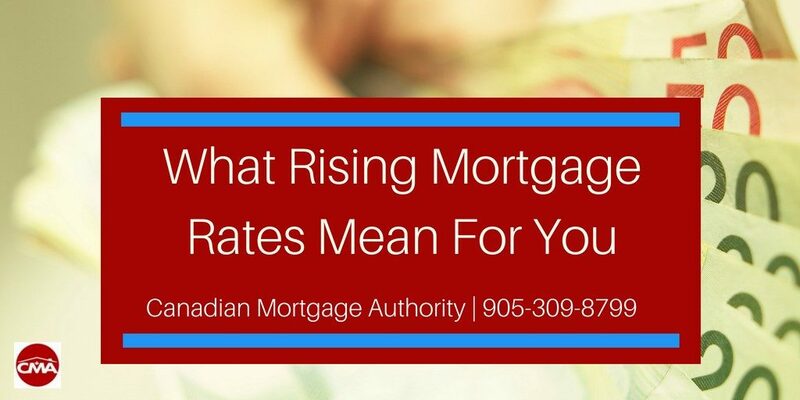 For more information on the rising mortgage rates, or to get started on your Grimsby or Hamilton mortgage application, please contact the Canadian Mortgage Authority team at 905-309-8799.